I think the thing that I love most about wild violets is that they are usually the first flower to show their face in early spring. Actually, where we live in Southern Oregon they come up in mid-February! These little purple flowers give us a nice little foreshadowing of spring when we’re still in the midst of winter, which is a welcome sight. They grow plentifully right in our backyard under the apple tree, which makes foraging for them rather easy. 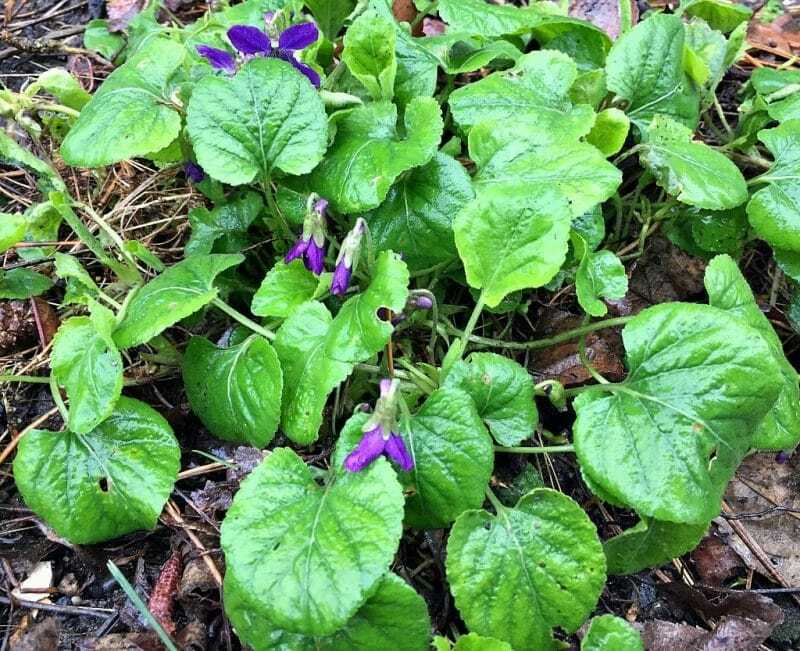 Even if you don’t have them in your yard, foraging for wild violets usually isn’t difficult, as they grow almost everywhere! 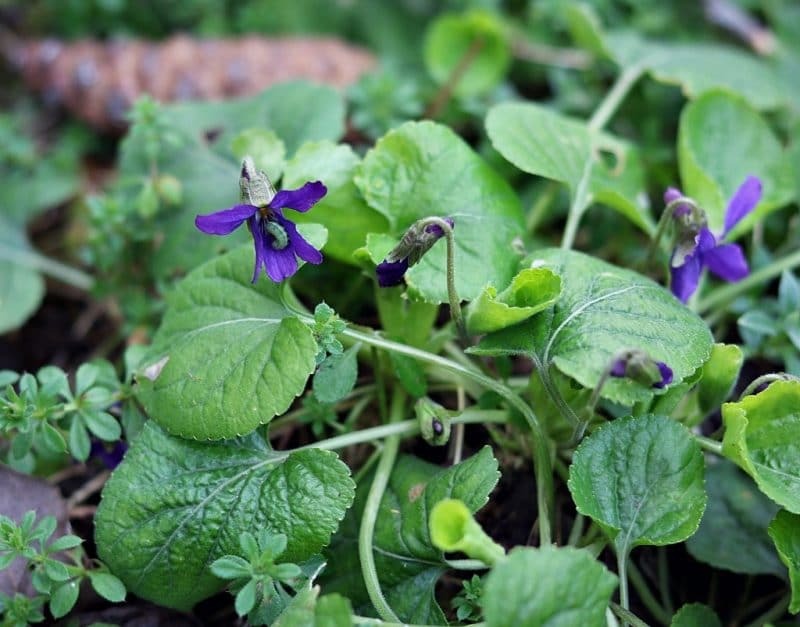 Wild violets are a low growing plant that prefers a shady, wooded area with rich soil. They have a basal rosette of toothed, heart shaped leaves, and drooping purple flowers with five petals that do not produce seeds. Interestingly enough, tiny round black seeds are produced from non-edible brown flowers at ground level. Wild violets mainly reproduce via underground rhizomes. Wild violets are not the same as African violets, which are not edible at all. Both the leaves and blossoms are edible, either raw or cooked, and are extremely high in vitamin C. The flowers are a wonderful late winter or early spring treat, and are often made into violet jelly or violet syrup. The leaves can either be eaten raw in a lovely wild greens salad, sauteed or steamed, or made into a tea. Violets leaves are also medicinal, with a soothing mucilaginous property. They are anti-oxident, anti-inflammatory, and a blood cleanser. They are good for coughs and colds, and can be made into a violet leaf and honey cough syrup. Violets can also be used topically for skin conditions like eczema, dry skin, bug bites, and vericose veins. Here are some homemade recipes for violet leaf balm and violet lotion that can provide some relief. 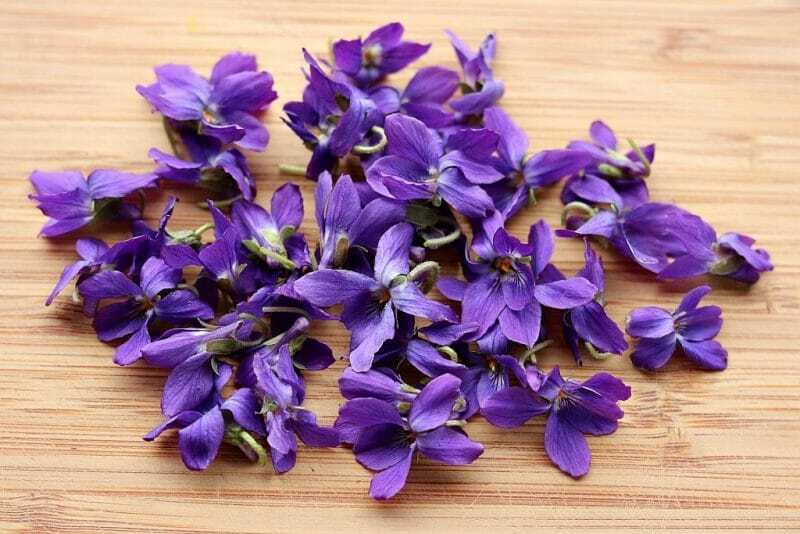 If you can’t find any wild violets, or if it’s the wrong season, you can purchase dried violet leaf from Mountain Rose Herbs (my favorite place to get high quality, organic dried herbs). 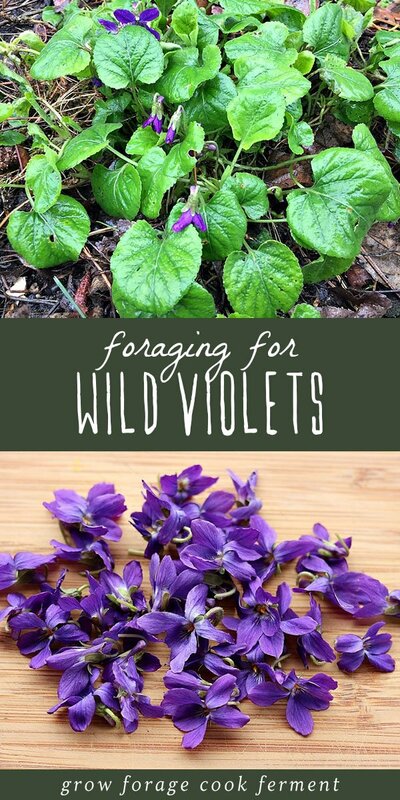 I hope this post inspires you to go foraging for wild violets! They are awesome little spring flowers that have so many great uses. 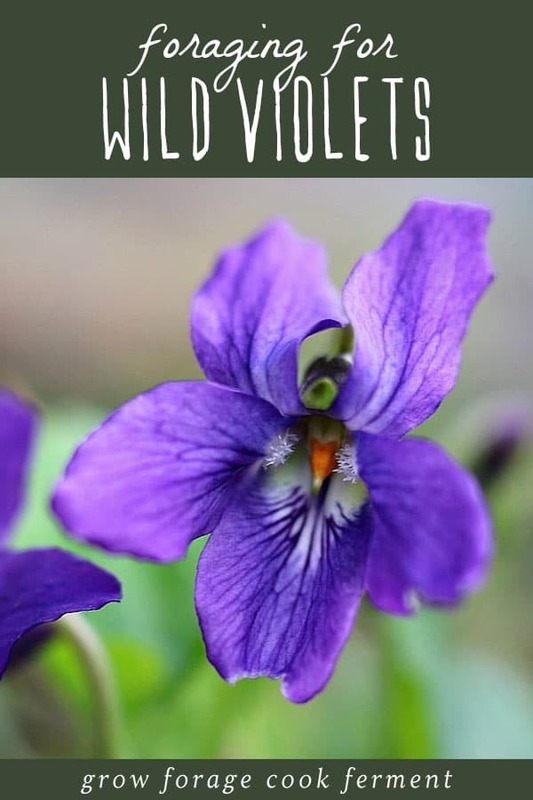 How do you like to use wild violets? Great article but it would be more helpful to show the look-a-likes that we’re not supposed to eat in photo alongside the edible violet. Everyone just says what not to eat, but never identifies them. I have some flowers growing in the yard each year but that I wondered if they’re violets but only have 4 petals instead of 5.Could some types have 4? Hmm, everything I’ve read has said 5 petals. I’d have to see a picture to be sure! This plant is a dicot which have 4 or 5 leaves. Sounds good for a mead!!! I’ll be collecting and drying these next year. What about the violet roots? Do you eat them? Raw? Cooked? Can you dig them up and plant them in containers for the patio? I just picked a a bunch from my backyard and can’t wait to try out the vinegar. Great info. Thanks! Thank You for the information as I am always looking for Blood cleansers .I have a blood clot in my leg and its been there since 2004 and I have been on warfin since then,but lately I have been looking into natural cures and cleansers and I can the feel and see the difference in my leg,Thank You and if you know of any other little helpers please let me know ? My sisters and I used to pick violets for our mother. She would always tell us to leave some for the bees. What a wonderful article about these sweet little flowers. I have numerous violet plants in my yard. Some of the violets are white and some are pink. Don’t know why, but your post just made me teary-eyed…???? A friend sent me your website. I am delighted to have it and sent a request to get your blog and look forward to reading more about your homesteading life . I am a homesteader in SW Michigan, blogger, writer/photographer and forager as well as a Reiki master, herbalist and chicken keepers. I have tons of violets and give them to my chickens in season with other fresh herbs which they adore. Blessings! Hello, I am in Southern Oregon too! While I have a couple of these sweet little plants in my yard, they seem to come back fewer and fewer every year. Any tips for encouraging more growth? I would really like more, and different colored flowers. PS. Just 2 days ago I was out taking pictures of the ones in my yard. I’d love to share one with you if you’d like. ???? Cloverkraut, violets are super simple to propogate. Try this….Dig up the non blooming baby plants and do both of these tips: 1) Put some violets in large pots and set in a shady and damp place (like any transplant, keep them damp and water them well) and watch them grow. By fall they will be ready to transplant into the ground. I dig out chunks of violets each spring and each fall and transplant them to new beds where I want them to spread out. They are super easy to transplant IF your soil is rich and well amended and you bed is well mulched in bark chips. I have zillions of wild violets, but I am very careful with the harvest of them and dandelions as they are some of the first “bee flowers ” available. What a fabulous post with so many great ideas (and links) to try. Our violets have just shown up and there are heaps of them! Now I just need to wait for a sunny day (don’t I?) to collect – hopefully it comes before the violets close up shop. Thanks for the great ideas. It’s hard to pick them because they are so cute and colorful this time of year. They have the most awesome sweet smell, too. I put them in my very tiny pottery vase on the kitchen window sill.